Phew, it wasn't easy... but they are still GREEN! The Kermit socks are all ready to go! I was surprised really at how fast these came along... I have only been working on them for a few days really (since June 22) so that makes them an 8 day pair of socks! When it comes to plain vanilla no-pattern socks, I know I can polish those off at an alarming rate, even a sock in an evening depending on the size, but when it comes to following a pattern, and figuring things out I can be pretty slow - I guess my reading and interpreting skills must be improving! yay me! Here they are in the rain on the patio furniture. It has been raining here for a week so there haven't been very many good sunlight days for photographing things. Even still, through the cloudy skies... these socks are friggin GREEN. They almost glow against the boring grey seat cushions! And here they are toute fini laying side by side on the sock blockers. I really had to push myself here - I finished and wove in the ends RIGHT AWAY. yes I avoided procrastination, and did it right then. It feels good to have these done, but at the same time they were so interesting and fun to work on, I'm kind of disappointed the love affair is over. I might have to search for some more handpainted yarn and try another pair sometime. I had planned on gifting these to my sister for Christmas, but her birthday is on the weekend. Sigh. I always make things for people thinking that I will give them the item for a major holiday months away... then I wuss out, get excited that the project is finished and turned out so well... and the recipient will really like it.... so I end up giving in early. I'm not sure if that makes me a really crappy secret keeper (can't even keep my own!) or if it makes me an exhuberant gift giver. I think it's ok to be excited that someone will like your gift so much that you have to (HAVE TO) gift it now... or at least that's what I'm telling myself. So I leave you again knitters of cyberspace... happy knitting! 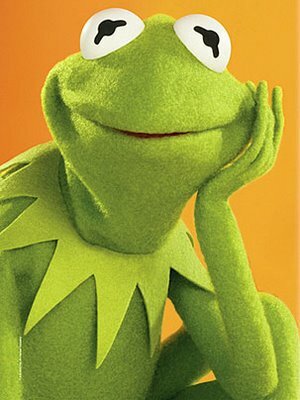 Kermit may think it's easy to be overlooked when you're green... but I doubt people will overlook these socks! While we were on our honeymoon, we got the chance to tour a couple of New Brunswick Wineries - Wine made from Fruit not from Grapes! Strawberries, Rhubarb, Raspberries, Blueberries! Just outside Moncton in Magnetic Hill we went to the Magnetic Hill Winery, housed in an awesome Mustard Colored period home that the owners are renovating. The view from this hilltop house is really pretty! The family who owns this winery have been fruit farmers for like 20 years, and recently began making fruit wines to help supplement their income and uses Raspberries, Rhubarb, Strawberries and Blueberries in their wines. One of them "Illusions" is made from Rhubarb, but totally tastes like a dry white wine! I guess that's why they call it Illusions?! The tourguide, and owner's son, also explained that the rolling hills on the property overlooking Moncton were being prepared for planting the farm's first Grapevines! Someday I hope to return and perhaps taste some of their grape wines? Marky with his tasting glass - and the selection of wines in the cellar! This winery had similar flavours, but had a wine made from Rhubarb that really tasted like Rhubarb! (this one was Marky's Favorite) and various blueberry wines ranging from Dry to Sweet to Dessert wines. Our favorite of the blueberries was a semi-sweet which really had a nice not-too-tart not-too-sweet blueberry flavour. I have Dad's Mittens mostly done, but haven't had a chance to photograph them on a model yet. As a tease... I'll post what I have so far. Overall I am very pleased with the end result on these... though they could probably use a good blocking just to smooth out any bumpy or wrinkly bits. 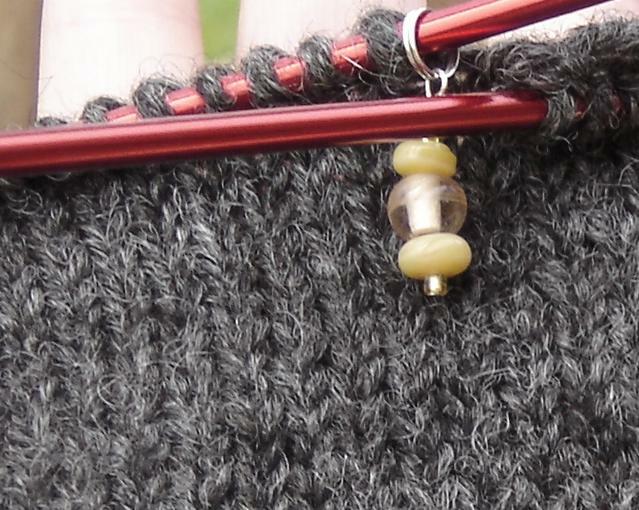 I'm not usually a "marker" girl either... but I found that working on the thumb gusset increases in this case because of the soft blended colour that I had a hard time seeing how many rows back since inc stitches. I guess it's nice to have some in the house, but loops of another colour of yarn would suffice really. I got a bunch of these beaded stitch markers in a grab bag - basically 25 of them in varied colours, none matching.